Headliner Tasha Viets-VanLear sings an original song during her performance at Evanston’s Juneteenth celebration Tuesday. The event was the latest in the Evanston’s summer Starlight Concerts in the Park series. 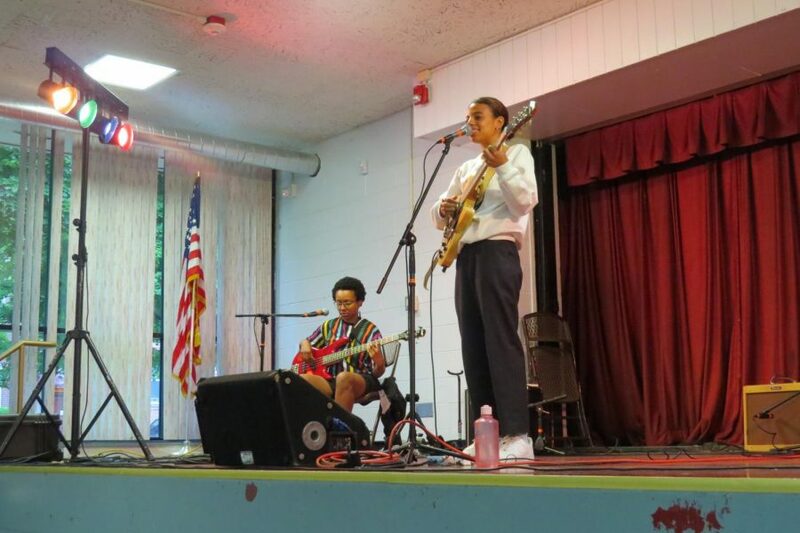 Rounds of the gospel song “Freedom” filled the Fleetwood-Jourdain Community Center Tuesday during Evanston’s Juneteenth celebration. The song was performed by a choir from Evanston’s Christ Temple Missionary Baptist Church before headliner Tasha Viets-VanLear took the stage. About 100 people attended the event, which was originally scheduled to be held in Twiggs Park, but moved to the center in anticipation of rain. The celebration was the latest event in Evanston’s summer Starlight Concerts in the Park series. Activities like face painting, drum making and beading were available, as well as food trucks from La Cocinita and Harold’s Chicken Shack. Juneteenth is the celebration of the true end of slavery more than two years after President Lincoln’s Emancipation Proclamation. On June 19, 1865, Union soldiers arrived in Texas and ordered plantation owners to free their last group of slaves, who had technically been free for months. Evanston community arts coordinator Angela Allyn told The Daily the city’s celebration began several years ago as part of a larger effort to diversify community offerings. The event educates those not part of the culture, and celebrates those who are, she said. Kenneth Cherry is the manager of the Fleetwood-Jourdain Community Center and pastor of Christ Temple Missionary Baptist Church. To him, Juneteenth highlights an “ugly part of history” many don’t talk about. Ald. Cicely Fleming (9th) spoke during the event not as an alderman, but “as a black girl,” she said. She read from an essay written by abolitionist Frederick Douglass and asked attendees to look past the holiday’s title and examine whether they, as black Americans, were truly free. There are still citizens in the United States who live under the conditions of slavery, Fleming said. Event headliner Viets-VanLear, who performs with the stage name Tasha, used to be a counselor and dance teacher for the park district and performed at last year’s Juneteenth celebration. The Chicago-based singer said her identity as a black woman is an important part of what she sings about and added that she likes to think her music “has a way of bringing folks together.” Viets-VanLear said Juneteenth is an opportunity to both celebrate and reflect. Viets-VanLear said Juneteeth is a “great day” to think about the ways in which black people are not free. Fleming also expressed this sentiment, noting that black Americans are still living under “an illusion” and clouded judgement.